Discover a more collaborative, real-time way to manage strategic initiatives. The success of your organization — no matter what size or industry — depends on the thoroughness of your planning and vision. A strategic plan can provide a roadmap for accomplishing specific goals, and will increase your chances of reaching objectives on time and budget. In this article, we’ve rounded up the top strategic planning templates in Microsoft Word and Excel, all of which are free to download and fully customizable. Additionally, we've provided customizable strategic planning templates in Smartsheet, a collaborative, real-time work execution platform that empowers you to better plan, manage, and report on strategic initiatives. Strategic planning is an organization’s process for defining their strategy so that they can accomplish specific goals and objectives. Strategic planning may be utilized on a large scale, such as planning for business growth over several years or to help a nonprofit or governmental organization reach its stated mission. A strategic plan can also be used on a smaller scale, such as crafting a marketing plan or developing strategy for the goals of one department within a business or organization. It is important to note that strategy is distinct from planning: While strategy looks at why certain steps should be taken, a plan outlines how to enact those steps. strategic planning marries these two concepts in order to determine the best possible course of action. The purpose of strategic planning is to provide a thoughtful, deliberate approach to reaching objectives based on an in-depth analysis of both internal and external factors affecting an organization. A strategic plan often covers multiple years, addressing both short- and long-term goals. It also provides a way of tracking progress and measuring success. However, it’s not a document that is fixed in stone — instead, it’s wise to revisit and adjust a strategic plan periodically based on the evolving vision, objectives, needs, and resources of a business or institution. Depending on the scope of your plan, you may be working with a team of multiple stakeholders during the strategic planning process. To keep the process running smoothly, make roles and responsibilities clear. Different parties may be responsible for providing data, reviewing the plan, or authorizing strategic decisions. As you prepare for planning, make sure all participants understand what’s involved in the process and have received any relevant information prior to meeting. One way to think about strategic planning is that it identifies any gaps between a current state and desired future state, and then dictates how to close those gaps — how you get from where you are to where you want to be. To that end, various factors are taken into consideration in order to formulate an effective plan. Here are some of the elements often included in a strategic plan. Introductory Statement: The introductory statement should briefly describe why the strategic plan was developed and for what time period, and list the authors of the plan. Background Statement: This section may provide information about the organization, such as history, management structure, and supporting partners or agencies. Alternatively, you could use this section as a brief business statement — more of an elevator pitch — to concisely describe your business. Organizational Structure: Include this information if it’s relevant to evaluate how your business or organization operates and is structured, from governing board to staffing. Vision: A vision statement should briefly describe what a company wants to achieve or become. This is one of the primary organizational tenets to consider, along with values and mission. Values: These are the principles that an organization stands for and abides by. Many businesses create core value statements to guide company culture. Mission Statement: A mission statement describes the purpose of a business or organization. This is distinct from a vision statement because it is not a projected goal for the future. Problem Statement: Some plans include a problem statement, which can outline key or discrete issues that need to be addressed. SWOT Analysis: A SWOT analysis provides a foundation and context for developing strategy by examining the strengths and weaknesses within and organization as well as external opportunities and threats. Goals: As stated earlier, a strategic plan may include long-term as well as short-term (i.e, monthly or quarterly) goals. Objectives should be measurable and broken down into actionable steps, and the action plan for each goal should specify who is responsible for implementing the strategy, a timeline for starting and ending the action, and how the outcome will be evaluated. Evaluation: Methods for evaluation should be spelled out in the strategic plan. This could include tracking key performance indicators (KPIs) and documenting the progress of action steps on an ongoing basis. Executive Summary: This final summary helps employees, investors, or other readers quickly understand your plan. 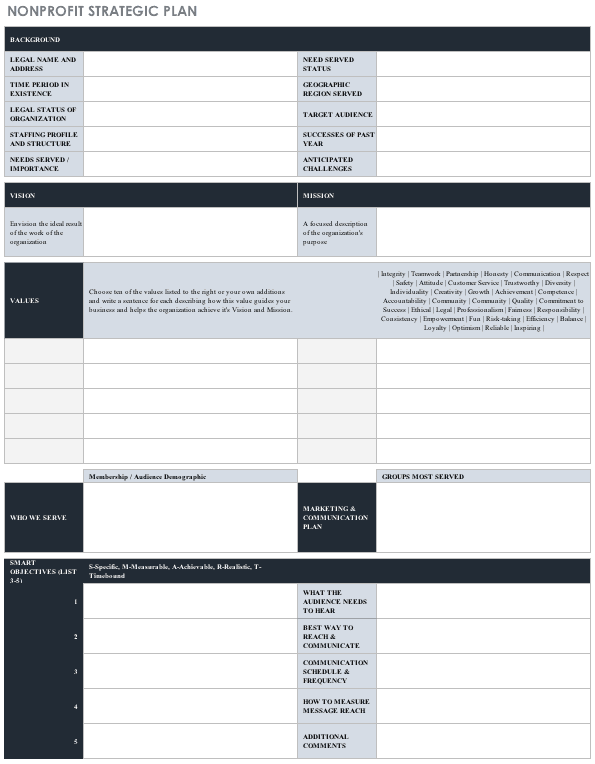 No matter what type of strategic plan you are working on, using a template provides a simple and quick outline to organize your process. In the following sections, you’ll find free, downloadable planning templates for business, nonprofit, human resources, marketing, IT strategic planning, and more. A comprehensive, strategic business plan may include company information, SWOT analysis, research, goals, resources, risks and more. A template provides structure for your business planning process as well as a communication tool that’s simple to update or modify. Use the template as a guide for evaluating your business, identifying opportunities for growth and development, and creating a strategic plan. A nonprofit strategic plan often emphasizes vision, values, and mission as the foundation for future objectives. 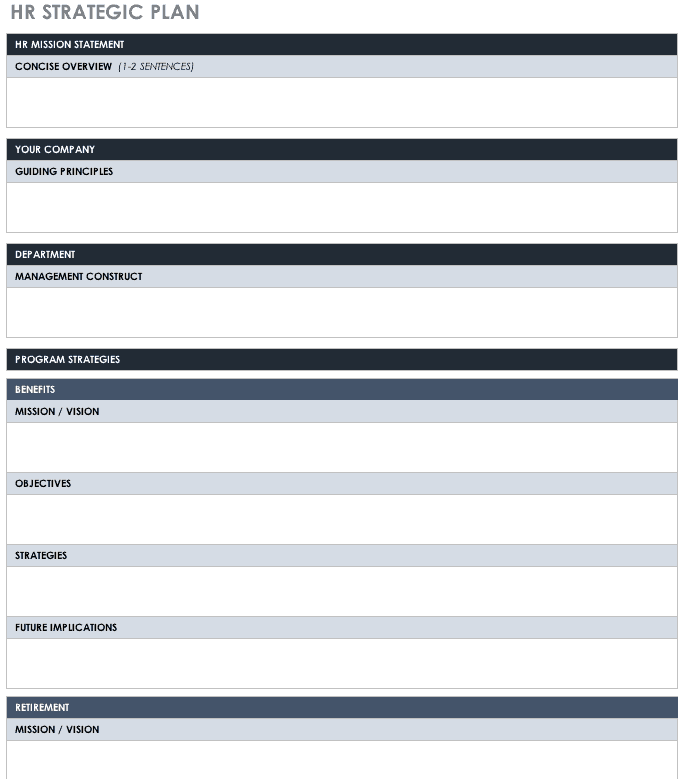 A template can be used to clearly define who is being served and what issues need to be addressed. As with a business plan, nonprofit planning may include sections for evaluating risks and opportunities, measuring financial resources, developing a marketing plan, and creating objectives for organizational change. Create a detailed human resources strategic plan for your organization, or modify the template to focus on one specific area, such as recruitment or employee relations. 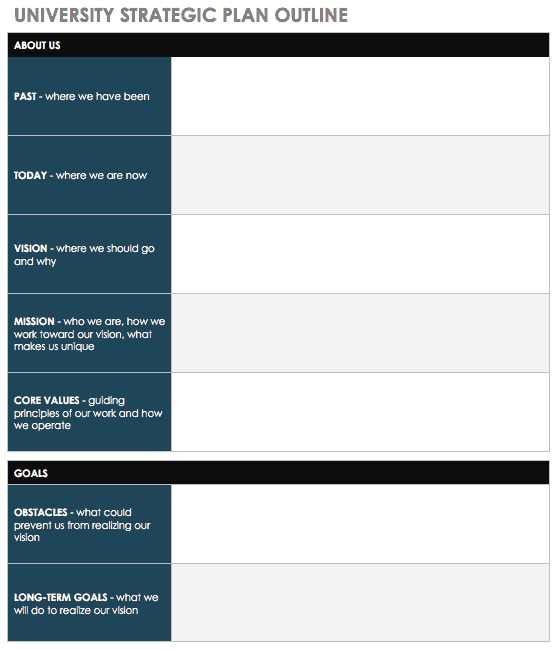 Use the template to translate strategies into measurable action plans. This simple layout makes it easy for readers to quickly view key information. IT is an essential part of any business, nonprofit, school, or government agency. While information technology is just one part of an overall business strategy, creating a separate strategic plan for IT will help ensure that you have a comprehensive roadmap to follow for managing and purchasing new assets, understanding your current and potential technology usage, and aligning your IT goals with business objectives. 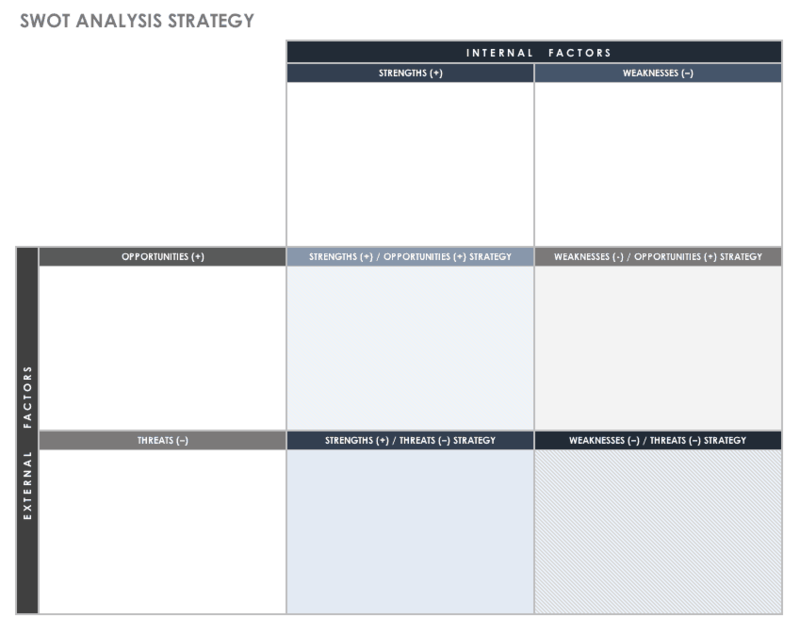 Use this free template to help shape your marketing strategy. It combines information on your target market and business with marketing tactics to help you think strategically and create a plan of action. 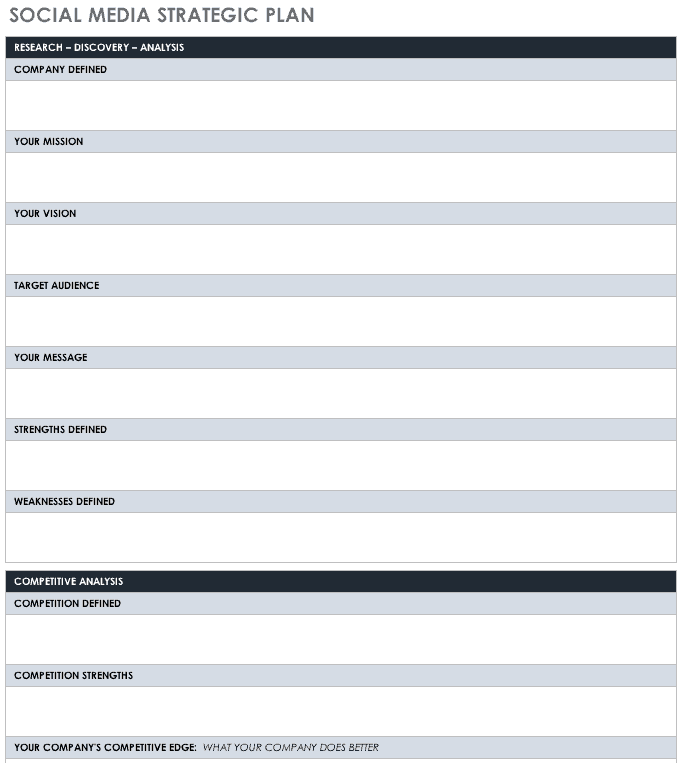 The template can guide your research process or be used as a simple brainstorming tool. Social media is an integral part of online marketing, and creating a strategic plan can help ensure that you are using your time and resources effectively. Consider your branding, mission, target audience, competition and other factors to determine which social networks and types of content will perform best for your company. Keep track of KPIs and adjust your social media plan accordingly. 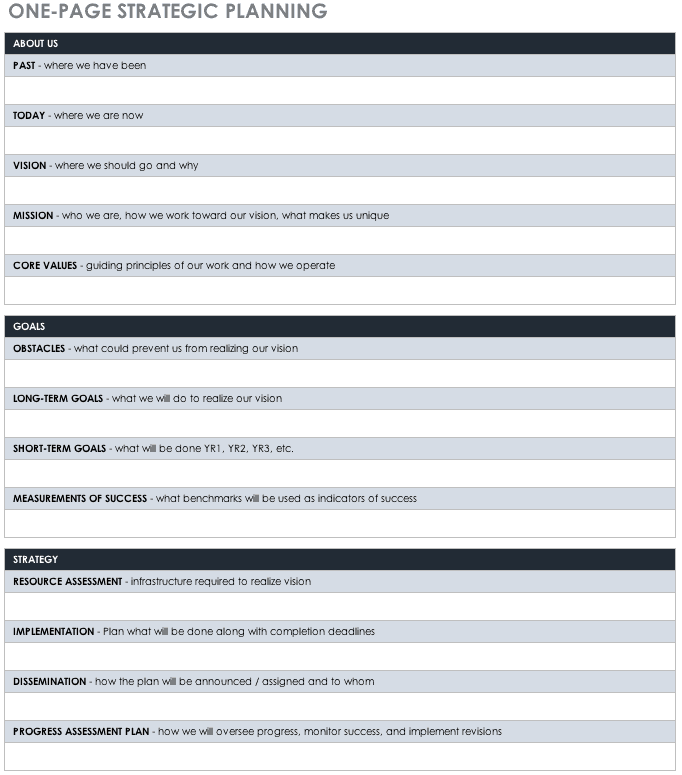 This matrix template combines SWOT analysis with strategic planning. Examine the relationships between your strengths, weaknesses, opportunities, and threats, and then list related strategies to tackle your goals. 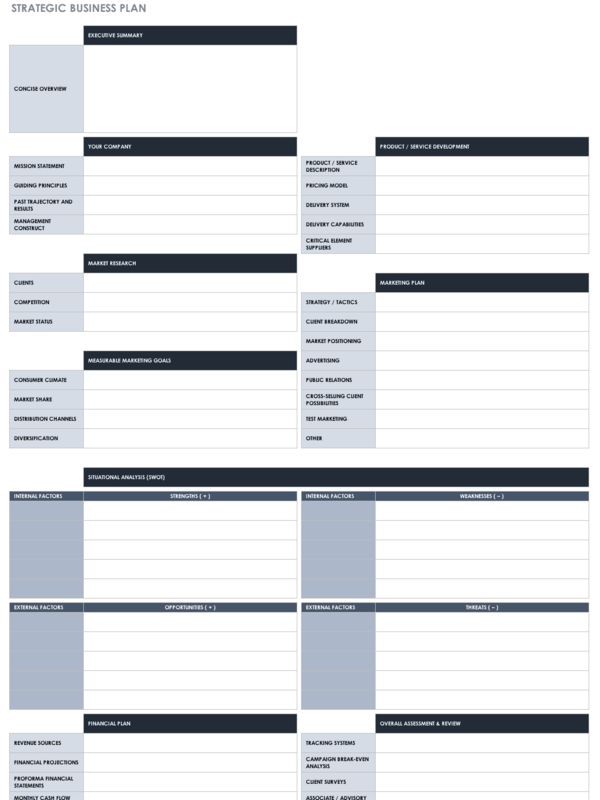 The layout of this template allows you to view the SWOT categories and strategies side-by-side, which may be useful for a presentation or summary. A one-page strategic plan is perfect for small businesses or for summarizing a longer planning process. 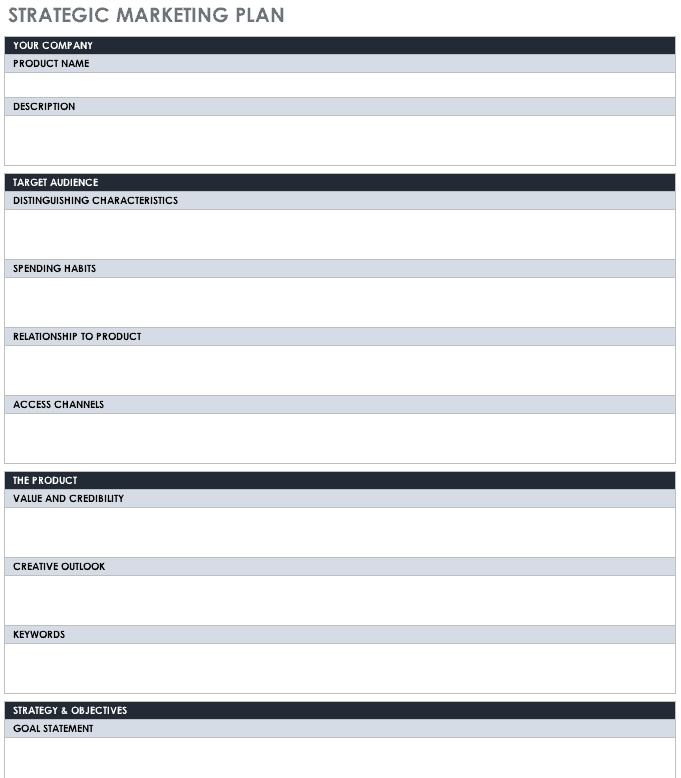 Use this template as is, or edit the layout or included information to better suit your needs. 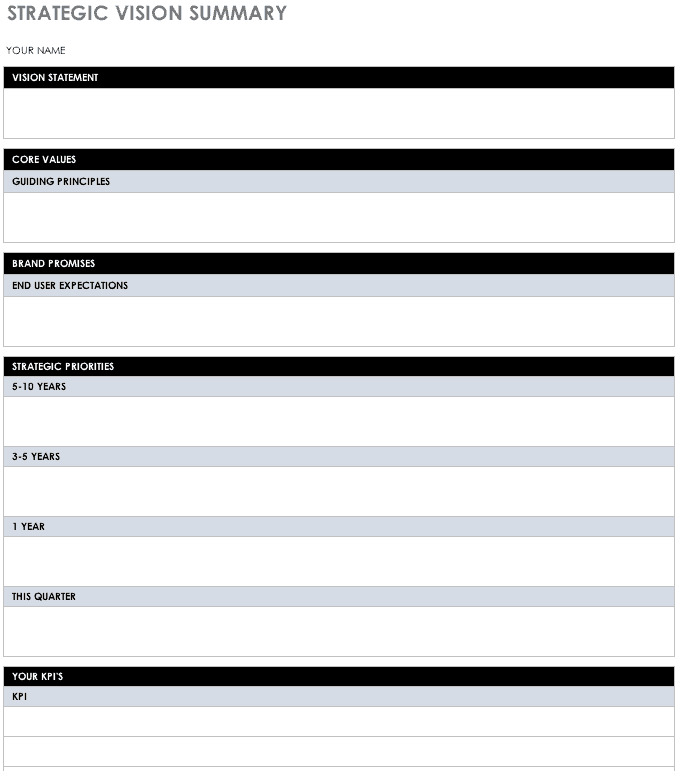 This template includes all the essentials on one page, including values, strengths and weaknesses, goals, and actions. Summarize your strategic vision and plan, highlighting key information for stakeholders, management, investors, or for your own reference. Combining a vision statement with a brief summary of goals, actions and KPIs makes it easy to see how your business values and purpose relate to your objectives. It also provides a succinct summary for use in a presentation or meeting. 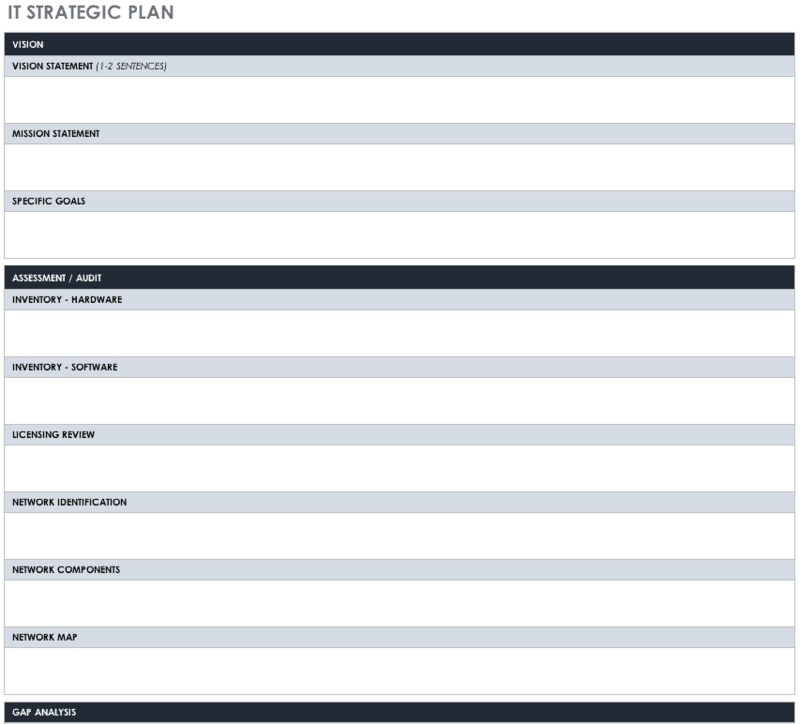 This template provides an outline for university strategy planning. The actual strategic plan may cover multiple pages and provide an in-depth analysis and detailed mission and vision statements. Strategic planning is an opportunity for universities to look closely at campus needs, institutional values, infrastructure, long-term goals, important obstacles, and more. The strategic plan will be a guiding document that is reviewed and updated regularly. The ability to create detailed project plans is important to the success of your strategic initiatives. To ensure that your plans reach the outlined goals and objectives on time and on budget, consider using a tool that enables you to plan, manage, automate, and report on project details in real time, and to share and collaborate on your plans with your team and key stakeholders. Use Smartsheet to streamline initiative and project planning, improve collaboration, and increase stakeholder confidence. Share project vision, details, and resources with internal and external stakeholders to increase transparency. Stay up to date on status with automatic alerts and use reports and dashboards to roll up details to ensure projects stay on track. 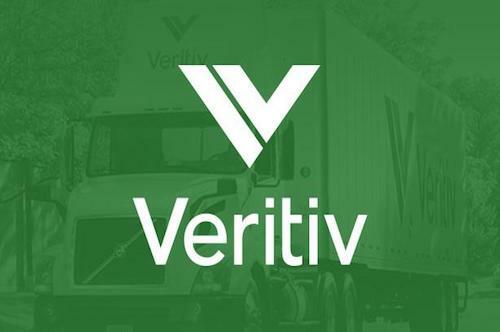 Discover how Veritiv used Smartsheet to innovate their project management capabilities. These are very useful tools. this is a very useful guideline to the beginners like us to enhance proficiency in the field.